Justice • Federal rules hoped to recover endangered species, but landowners cry foul. The Associated Press A federal lawsuit filed Thursday targets new federal rules that restrict the removal from private land of Utah prairie dogs, like this one seen in southwestern Utah. 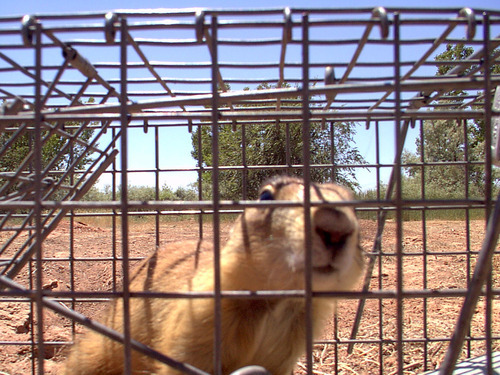 A federal lawsuit filed Thursday targets new federal rules that restrict the removal from private land of Utah prairie dogs, like this one seen trapped for relocation in Iron County. 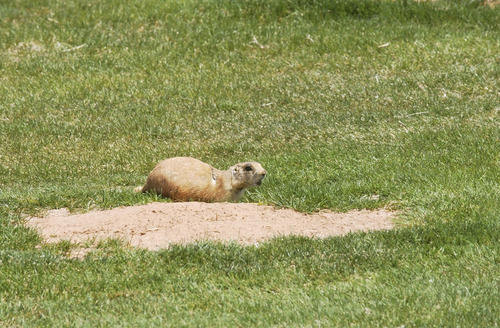 Courtesy Division of Wildlife Resources Tribune file photo A federal lawsuit filed Thursday targets new federal rules that restrict the removal from private land of Utah prairie dogs, like this one seen at a Cedar City golf course. Bruce Hughes owns a 3.4-acre lot on the west side of Cedar City that he has hoped to develop into commercial real estate for years. But the presence of a protected rodent on the land makes it impossible for him and many others in Iron County to get building permits, rendering their land unusable and worthless, according to a lawsuit filed Thursday in federal court in Salt Lake City. In the mid-2000s when Hughes first proposed building on West View Drive, there were 58 prairie dogs on the property that would presumably be displaced. But under federal rules Iron County property owners could "take" only a total of 72 prairie dogs a year and any one owner was limited to removing 10 a year, according to Hughes, a longtime Cedar City CPA. Seventy owners were ahead of him. "By the time I got to the top of the list, it was several years later and the market turned and the banks wouldn&apos;t loan to build," Hughes said. The suit seeks to toss U.S. Fish and Wildlife Service rules that restrict the removal of Utah prairie dogs from private land. The Pacific Legal Foundation filed it on behalf of People for the Ethical Treatment of Property Owners, a property-rights group whose name plays on that of the animal-rights group PETA. Lead counsel Jonathan Wood argued the rules hold Iron County residents "hostage to a species that has become an out-of-control pest." Though the animal has been listed under the Endangered Species Act since 1973, it appears to thrive in Iron County, burrowing in golf courses, cemeteries, airports and agricultural fields to the dismay of property managers and local officials. A prairie dog disrupted a recent funeral at the historic Cedar City Cemetery by scampering around and barking, while others chewed up remembrances left at grave sites, the suit alleges. "The federal government should protect and preserve the species on its own land, and leave the citizens of Cedar City and other towns free to take common-sense measures to control the prairie dog population in their midst," Wood said. Federal officials said they could not comment on the property-rights action, which names Fish and Wildlife Service and its parent Department of Interior, because it pertains to pending litigation. The Utah Legislature sympathizes with people like Hughes. Last session, lawmakers passed a resolution asking the federal government to hand prairie dog recovery to Iron County. Federal prairie dog regulations pose a major drag on the local economy, derailing numerous projects such as a proposed dairy expansion, according to Iron County Commissioner Dave Miller, who testified before the Legislature in February. 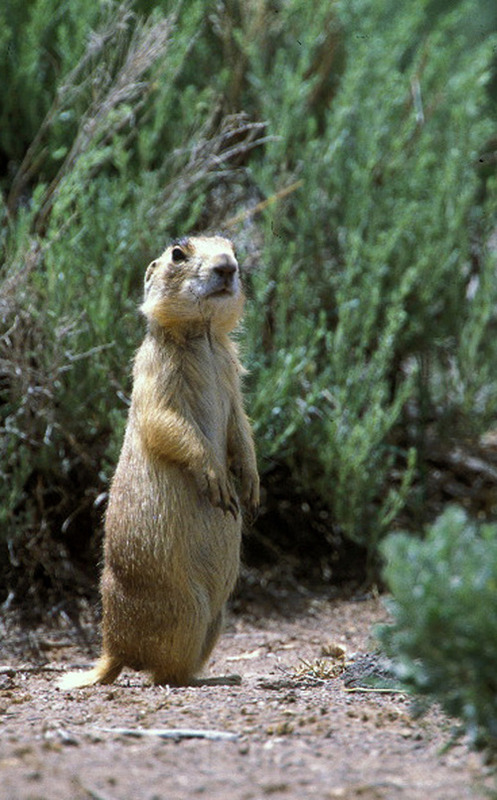 The Utah prairie dog is the western-most of the nation&apos;s five species, inhabiting a few counties in southwest Utah. At the time of listing, there were just 3,300 in 37 colonies, but now exceed 40,000 with most living on private land, according to federal documents. Federal authorities have moved thousands to public lands, but prairie dogs continue to proliferate on private holdings and many of the remedies the government offers are far from adequate and prohibitively expensive, critics say. "It is not something the federal government should even be even involved in," Wood said. "You have a constitutional right to use your property. The government can&apos;t make you buy that right back just because it passed a regulation." The regulation in question, known as the 4(d) Rule, carves out exemptions for public safety, burial sites and some agricultural lands. This generally requires the landowner to exhaust non-lethal remedies, which is why expensive fences encircle the Parowan airport and Paragonah cemetery. "There are many reasonable resolutions to conflicts between landowners and prairie dogs, short of killing them," said Taylor Jones of WildEarth Guardians. While prairie dogs&apos; digging damages agricultural equipment and wrecks golf courses, these three-pound rodents are considered a "keystone species" that plays a vital ecological role whose benefits are hard to quantify, according to biodiversity advocates. Their burrows help aerate and mix the soil, allowing for greater penetration of water and nutrients and resulting in healthier vegetation and better habitat for other species.